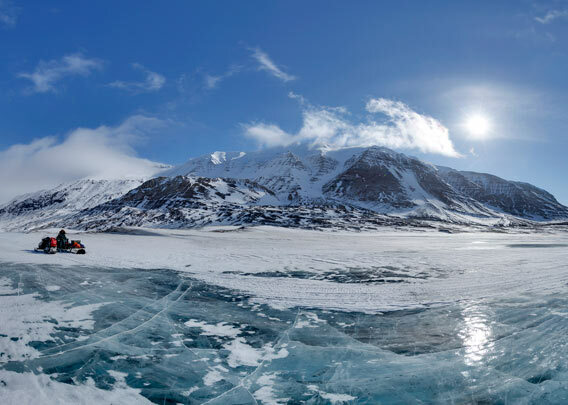 This panorama was taken on a frozen lake with beautiful blue ice between the moraine and the glacier Ragnarbreen. The wide space between the moraine and the glacier, now filled by the lake, indicates the retreat in recent decades due to climate changes. During the winter season, Ragnarbreen is part of an overland route from Longyearbyen to Pyramiden. In contrast to the (so far) more common route via Nordenskiöldbreen, this route does not depend on fjord ice in Billefjord. Part of this route is, however, only allowed to travel if you are either a registered local or together with a local or a guide. Frozen lake between Ragnarbreen and its moraine.